"Salam. To our loyal supporters out there, here's some good news for you. We have released our THE BEST OF GERHANA SKA CINTA album. 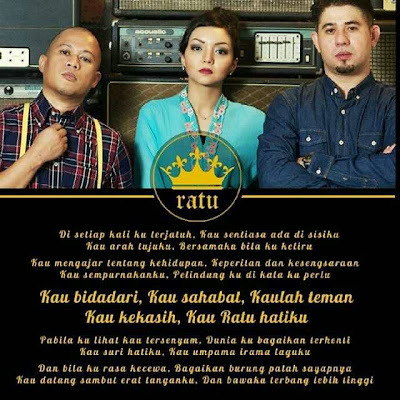 Ada 2 lagu baru, RATU and another (unreleased track) ANDAI. Ratu is quite an emotioal song, composed by Edy J Herwan. Buat sementara waktu, you can ONLY download these 2 songs from KKBOX. Insya Allah will shoot for the music video soon. So sementara tunggu updates, jemput ambik feel lirik lagu RATU ni dulu. Kalau korang ada RATU di hati korang tu, mak ke, bini ke, anak ke, you may want to tag them here. Or dedicate this lyrics to them. Why not? :-D Pray & express your ♥ everyday before its too late. ;-) Feel free to repost/share this. Selamat bercuti & Happy Chinese New Year to those celebrating. NOTA: Pemain dram Gerhana Ska Cinta, Bakri ialah abang kepada pelakon, Emma Maembong.